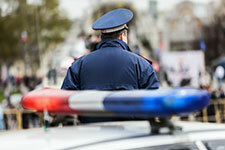 Police officers and law enforcement officials are regularly put in harm’s way as part of their jobs. Whether they serve as traffic patrol officers, undercover officers, investigators or in other positions, they can face the possibility of violence and injury when dealing with people who may be breaking the law and facing criminal charges. While facing such risks is an inherent part of their jobs, it’s important that police and other law enforcement agents know that, when they sustain injuries while working, they will usually be entitled to workers’ compensation benefits to cover their medical bills and lost wages while they focus on their recovery. In this two-part blog, we will highlight some important fact to know when it comes to workers’ comp benefits for police officers and other law enforcement officials. If you work in the law enforcement industry, have sustained an on-the-job injury and need help with your claim, don’t hesitate to contact Denver Workers’ Compensation Attorney Jennifer Bisset for help getting the full amount of benefits you deserve. Fact 1: Workers’ comp benefits for police aren’t affected by fault. If you are a police officer or law enforcement agent in Colorado and you are injured while on duty, you will generally be entitled to workers’ compensation benefits regardless of who was specifically at fault for causing the workplace injuries (or what was to blame for the injuries). This is because Colorado is a “no-fault” state when it comes to workers’ compensation benefits. Therefore, even if you yourself were partially or fully to blame for your on-the-job injuries, you will still likely be entitled to workers’ compensation benefits for those injuries (so long as you weren’t under the influence of alcohol or drugs when you sustained the injuries). Fact 2: Police can receive benefits for various types of physical injuries sustained on the job. Look for the upcoming second part of this blog for some additional important facts and information regarding workers’ compensation for police officers. If you are a police officer or any type of law enforcement official who has been injured at work, Denver Workers’ Compensation Attorney Jennifer Bisset wants you to know that she is here to aggressively advocate your rights and help you obtain the benefits you need and deserve. At the Bisset Law Firm, all of the experienced legal professionals are dedicated to providing each of our clients with the highest quality legal representation and helping them obtain the best possible results for their cases.